« …Et beaucoup d’entre vous dans la profession sont effectivement inquiets de ce que ces technologies pourrait perturber massivement le système actuel […]. Il parait qu’un mauvais esprit aurait répondu : « Tant que le secteur bancaire usera et abusera de ses privilèges indus, de son opacité et des avantages de l’in-traçabilité des billets de banque émis par les banques centrales, le bitcoin a encore de beaux jours devant lui ». Pourtant, après plus de 80 annonces nécrologiques en cinq ans, Bitcoin est toujours là. « Many of you have heard about not only bitcoins but blockchains and that unbelievable technology that underlies the Bitcoins of this world at the moment, and how incredibly convenient it will be to actually generate trust and identify players and whatever pseudo they decide to use. And many of you in the industry are actually worried that those technologies are going to massively disrupt the current industry […]. If those new technologies and as long as those new technologies are going to abuse, take advantage of, the yield for anonymity, I think the banking industry has quite a few good days ahead of it as long as it takes ownership of those issues of capital and culture in order to actually restore the trust without which you see no trade no transaction no business can take place. » – Christine Lagarde. 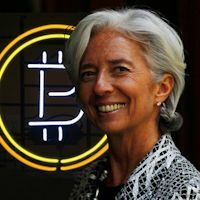 « This is my personal opinion, there will be no real, non-controlled currency in the world. There is no government that’s going to put up with it for long … there will be no currency that gets around government controls[…]. The technology will be used, it may even be used to transport currency but it will be US dollars. » – Jamie Dimon.